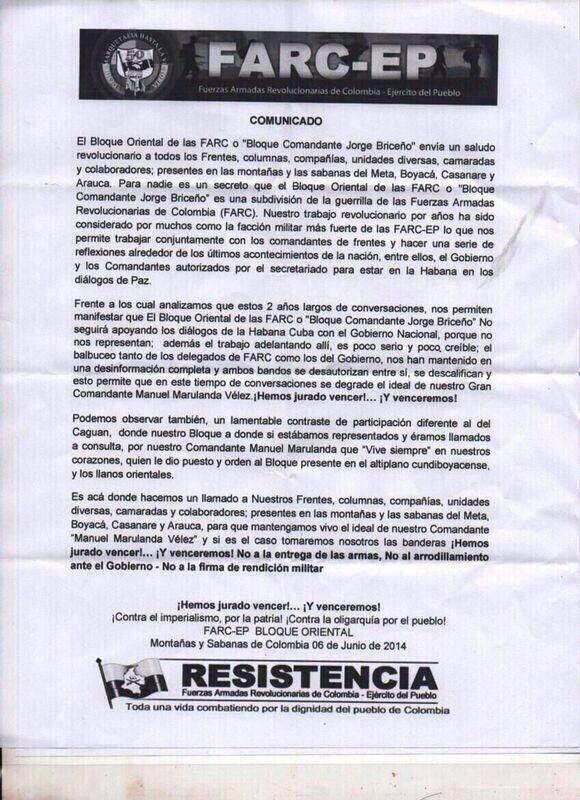 As predicted, FARC factions express disenchantment with the peace talks in Havana. See: FARC likely will reorganize into splinter criminal groups. The communiqué spoke of a peace process “without a future,” and said the “work” advanced so far in Havana is not serious and lacks credibility. It said the dialogues “degrade the ideal” of FARC founder Manuel Marulanda Velez. The FARC’s Eastern Bloc is one of the strongest; at the end of the 1990s, it represented 50 percent of the FARC until its leader, Jorge Briceño, alias Mono Jojoy, was killed by the Armed Forces on September 22, 2010. In 2003, it was comprised of about 7,100 combatants; today there are about 3,500. Two of its top commanders voluntarily demobilized four days ago, on August 1. Though the FARC’s Eastern Bloc move in the departments of Meta, Casanare, Arauca, Vaupés and Vichada, the group was organized in 1987 as a mobile column with the goal to surround Bogotá and so isolate and capture the capital. The FARC’s Eastern Bloc includes urban groups. It recruits university students in Bogotá who act clandestinely and “compartmentalized,” meaning they must hide their membership and simply follow orders. The group is responsible for “miraculous fishing” — setting up roadblocks and “fishing” for people to kidnap. They also threaten to death and exile elected officials in the municipalities under their control. The FARC’s 44th Front, which is part of the Eastern Bloc, has in the past expressed its refusal to demobilize in any peace agreements. « Santos: if FARC continue destroying infrastructure, no reason to continue peace talks.